How We Roll, March 22: is gentrification an inevitable byproduct of building rail? 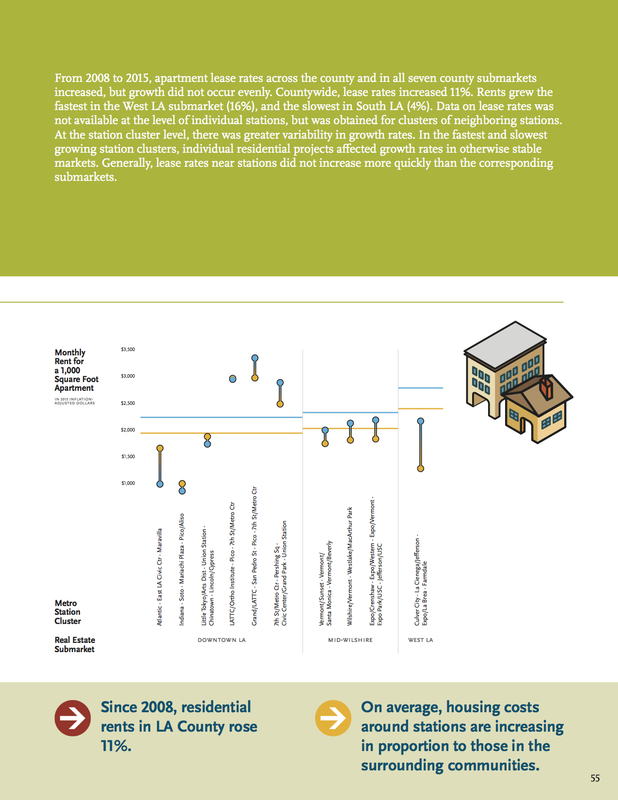 The article summarizes research UCLA’s School of Public Affairs that found that new development and gentrification near Metro Rail stations is squeezing out low-income residents. This article doesn’t try to quantify the scope of the problem, but does include plenty of interesting anecdotes and points to Little Tokyo and Highland Park as examples of rising rents/home prices after the arrival of the Gold Line. They found that in some of the neighborhoods immediately surrounding transit stations, rents rose at a much faster rate than in other parts of the county. Compared with areas not close to transit, these neighborhoods — many being low-income and minority-dominated — saw greater increases in their populations of white people, of those who are college-educated and of those with higher incomes. Especially in and around increasingly residential downtown Los Angeles, the presence of transit stations closely correlates with rising costs and signs of gentrification. Stuart Gabriel, director of the UCLA Ziman Center for Real Estate, says the development of transit through these historically underserved neighborhoods is bound to have complex effects. “We don’t want to say that we don’t want rapid transit near low-income neighborhoods. It’s exactly the opposite,” Gabriel says. “These are neighborhoods that need and use other-than-automobile transportation, and need and can benefit from the economic development which comes with rapid transit stations. The UCLA researchers and others argue that their point isn’t to stop transit — rather, to ensure that policies are in place to help protect low-income housing near transit. Metro has also done some research in this area that was included in the agency’s Quality of Life report released in February — and came to somewhat different findings, namely that rents and home prices are rising everywhere and changes near transit stations was in line with those changes. It goes without saying that gentrification is a sensitive topic, especially in a place such as Los Angeles County where there are dramatic disparities in incomes. When transit is added to the mix, the topic gets even tougher — perhaps because the median household income of Metro Rail riders hovers at about $20,000 annually compared to $56,000 across L.A. County. 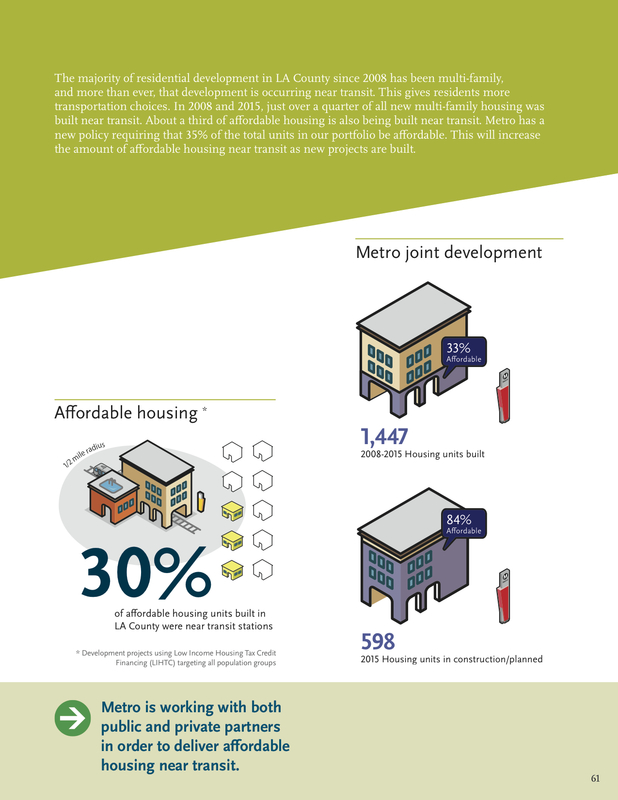 In short, the challenge is keeping neighborhoods near Metro Rail affordable to those who depend on transit the most while accommodating economic growth. I personally think expansion of Metro Rail is overall a very good thing, but let’s face it. When it comes to cities and the modern American economy, the challenges keep coming. 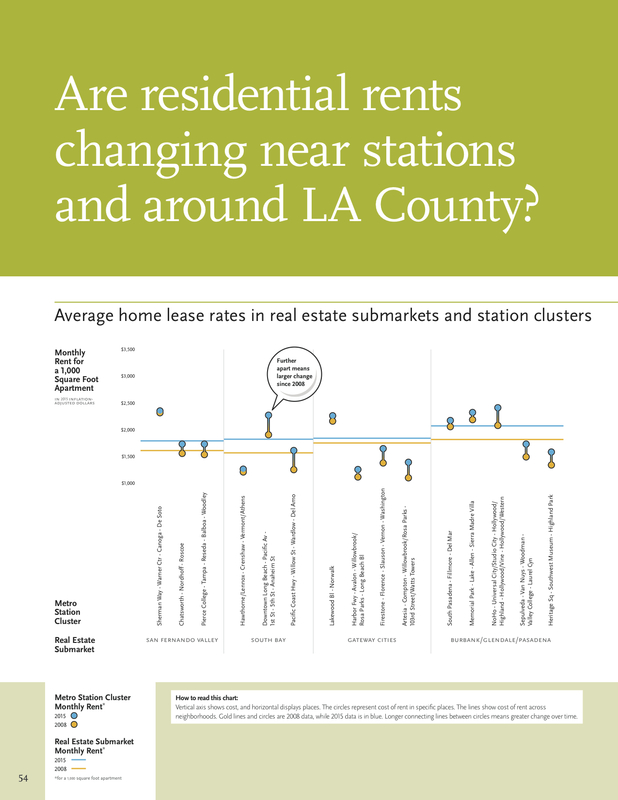 Related: here’s an article in LongBeachize about rising rents in Long Beach and the rest of the state. The Blue Line has been serving Long Beach for nearly 27 years and I have a tough time believing that soaring rents in Long Beach have much to do with the Blue Line, which peaked in ridership in 2012 and ’13 has seen a dip since then. Related 2: good post by our Joe Lemon about 12 neighborhoods in our region before and after rail transit arrived, including maps. Los Angeles isn’t exactly the first city that comes to mind when you think “bike-friendly.” It’s enormous, polluted, and hot. But, as much of the country looks to California to lead the way on climate action, more people are paying attention to the transportation choices of the City of Angels, which contains roughly a quarter of the state’s population. As the piece notes, well over 100K rides have already been taken using the Metro Bike Share bicycles, helping to reduce smog and greenhouse gases that contribute to climate change. Metro Bike Share is also coming to Pasadena, the Port of Los Angeles and Venice later this year. Congratulations to Avital and Rubina! The hypothesis: some people are willing to put up with longer commutes when they no longer have to do the driving. Based on that, Let’s Go LA believes driver-less cars will lead to more cars on the road, leading to more traffic, leading to longer commute times. What a double bind! If you try to make the neighborhoods nice where poorer people live, then richer people will want to live there, and the poorer people will be driven out by rising rents. So the only way for poor people to have stable housing is for their neighborhoods to remain unpleasant — that’s what will keep the rich out. Evidently helping anyone is self-defeating. Isn’t there some way around this? Rail transit is just an amenity added to a community. 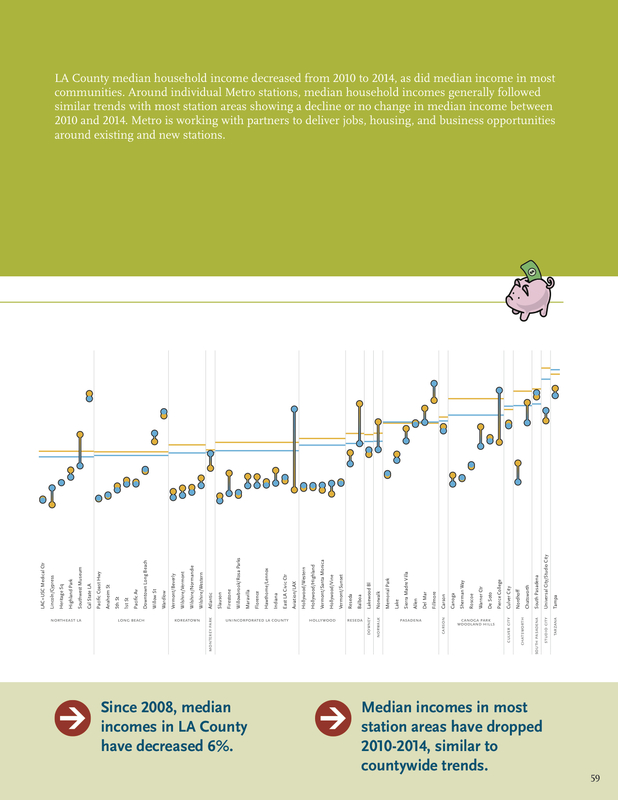 Neighborhoods get better when they have better amenities because they get more desirable. It could be better schools or a new park. The Vermont at Wilshire and Vermont: Across from Red/Purple Line Station, $2405 – $4892 a month. That means rent would be 28,860 -58,704 a year. Economists say that rent should be roughly a 3rd of income. That being said, to live comfortably and be economically active, you’d have to make about 87k-176k to live in that development. No one at that salary is riding metro on a daily basis; no one. Across the street there is the TOD, Wilshire Vermont Apartments: Studio $1,773 – 1,901 1 Bedroom $2,073 – 2,780 2 Bedrooms $2,754 2,947. For a studio, Annual rent: 21,276, multiply that by 3 and we should be making 63,828. This is for a studio people; as in 1 person. Who here that is single makes 63,828 and cares to live in that development? How does this work and who does pay? 1) Rich parents. Hancock Parks poolhouses empty every time a ribbon is cut 2) Air BNBers….Yep. I see so many people get taken to the airport from one unsaid development. This is an everyday occurrence too. Low Income housing is needed. At least a 3rd of these places should have people that make just about 20-24k and give them cheap rent. Better yet, maybe some form of escrow account so that if they do get a better opportunity, it can be maximized. Money talks, and many do not care WHERE it comes from. I make that and I ride metro daily. I live 5 blocks from the subway though, not right on top of it. I commute on the Expo Line daily to Santa Monica, and have many coworkers/acquaintances who do as well. Many are at or above the 87-176k household income range you cited, and in fact specifically chose to live near rail to no longer commute by car. If rail is more convenient/faster than driving, safe, clean, and takes high income commuters to their place of employment, they will use rail. The attitude that only low income individuals take rail is a uniquely LA mindset, and does not exist in other metropolises such as San Francisco, New York, Chicago, Tokyo, London, Paris, etc. Fortunately, this attitude seems to be eroding as Metro expands its rail presence to take commuters where they need to go. All around the world residential units near rail are desirable and therefore more expensive. LA will not be an exception. I could see an even worse situation, with regards to driverless cars… I’ve been tempted to drive Burbank to Santa Monica in the morning, send the car home and then take Expo/Red back home.